The September breakfast is the 3rd Anniversary of The New Media Breakfast; yes, it’s been three years since we started or monthly knowledge sharing events. We are pleased these have now become part of the regular calendar at No.29. We also thank No.29 for all of their support during the past three years; they really make it easy to host an event of this nature. 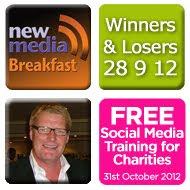 The September New Media Breakfast will explore social media winners and losers. This is a topic we’ve had requested in the past so we’re pleased to be able to bring it to you now.